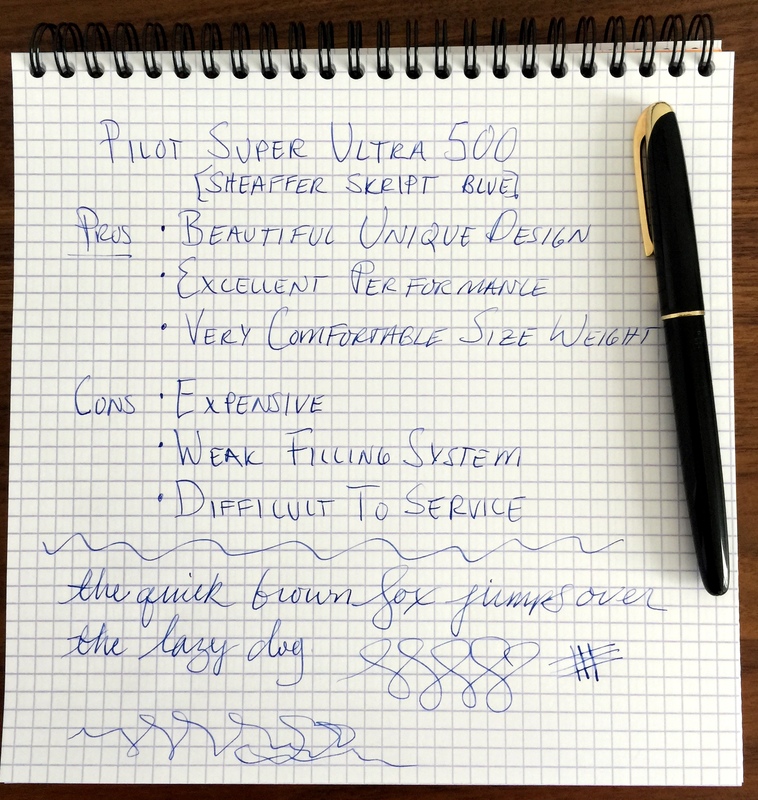 About a year or so ago I saw the Pilot Super Ultra 500 on the Fountain Pen Network and I was blown away by its beautiful design. The hunt began and in September I was able to locate one in Italy. The filling system needed a new sac so I sent it over to John Mottishaw for refurbishment. Now that I have had it in my hands for a few months I thought I would share my thoughts on this awesome pen. The black plastic version is the most beautiful (and luckily the most common) 500. The ones with gold filled caps lose the wonderful mirrored design that make this pen so fantastic. 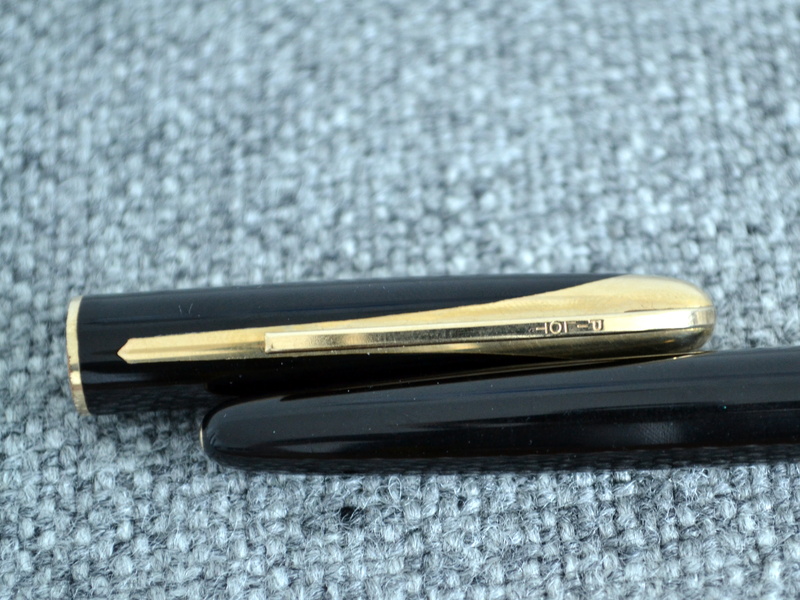 The inlaid gold nib is gorgeous and despite all of this beauty that I keep harping on about the pen is a reserved and understated elegance that I find very appealing. Gold tassie at the end of the barrel. This pen ticks all of the design boxes for me. The majority of products that come out of Japan today are of a very high quality and I am certainly happy to pay a premium for a “made in Japan” product but in 1958 the sentiment was different; Japan was considered an emerging market that produced more affordable products. Does this have an affect on the quality of pens coming out of Japan in the late 50? I don’t know BUT I can confidently say that the 500 is of a high quality. 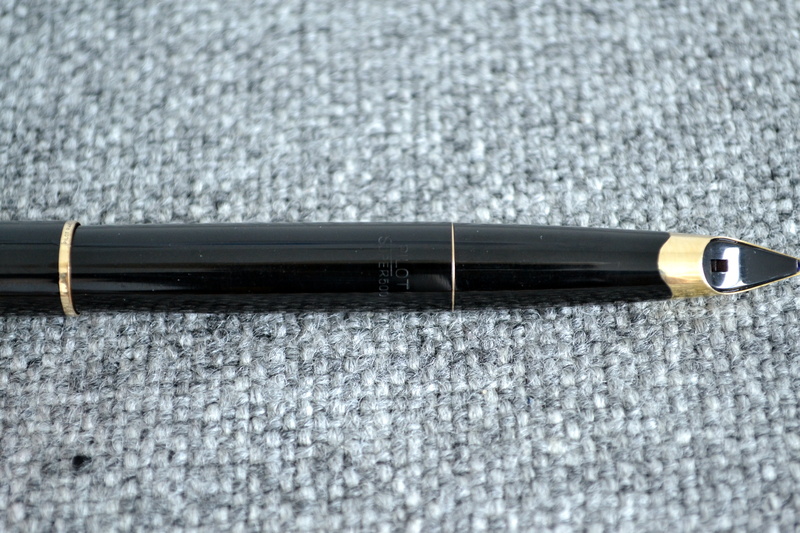 Would consider it superior to a Montblanc or OMAS from the same time period? No, not really. The black plastic body has held up quite well and the rolled 14kt gold trim is well done, though there is wear on the bottom of the cap ring. From reading Bruno Taut’s wonderful articles on the 500 (please see the links to his site, Crónicas Estilográficas, at the bottom of this review) I learned that the 500 was considered to costly to manufacture and as a result was only produced for a couple of years. The 500 measures 14.1cm long capped and 12.7cm uncapped and 1.2cm at its widest point. The 500 weighs a comfortable 18.3 grams. This is a very nicely sized pen that I have had no problem writing with for extended periods of time. 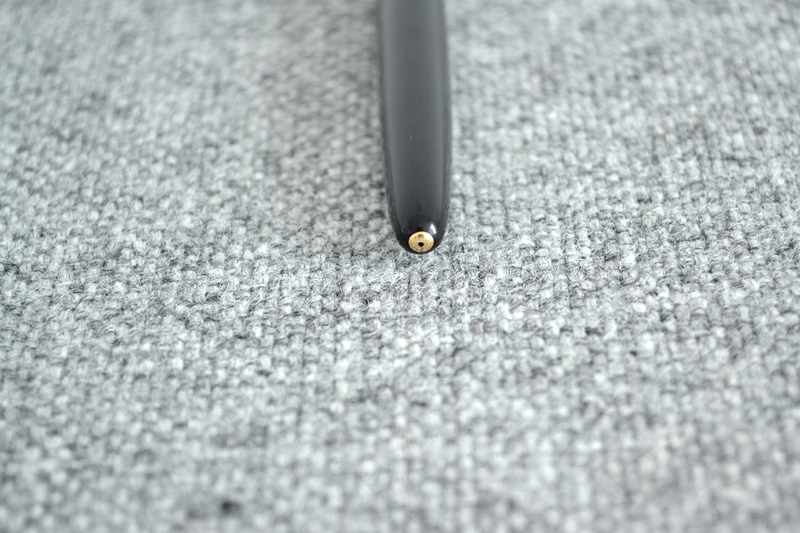 The nib writes with an extra fine line by western standards but find the nib to be quite smooth despite it’s point size. 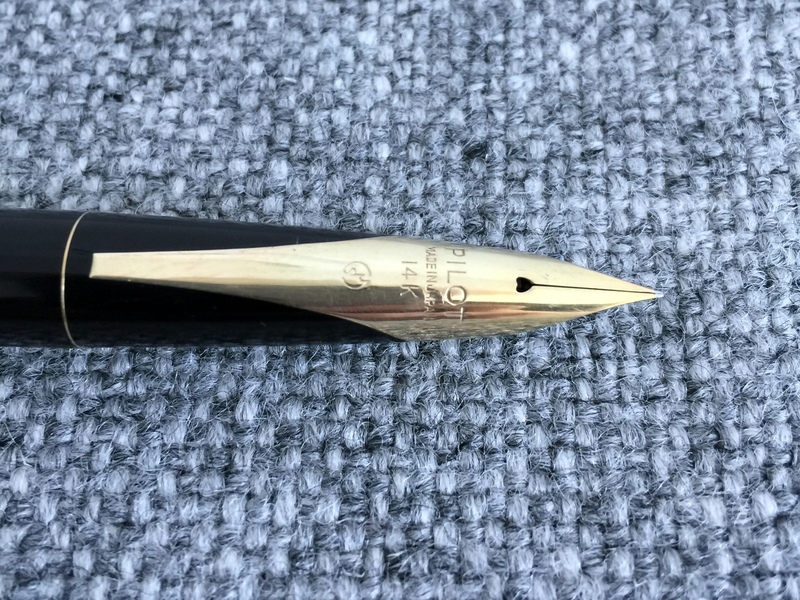 With a bit of pressure the solid 14kt gold nib does offer some line variation, though I am cautious not to push too hard as any damage to this nib would be a small tragedy. I have not had any issues with hard starting or skipping. It is by all accounts a great nib. The 500 has what is known as a “switch” or “quarter turn” filling system. 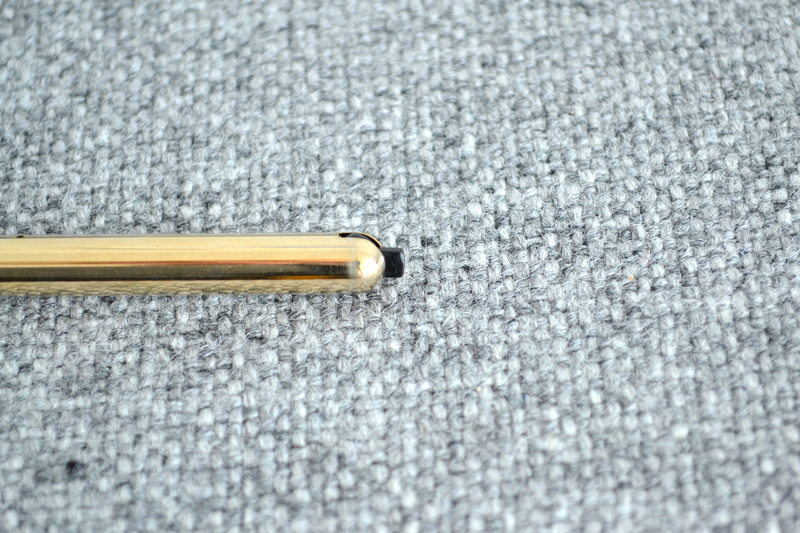 To fill you insert the nib into a bottle of ink and move the notch 90 degrees, this makes the pressure bar squeeze the sac just like on a regular lever filler. When I received the 500 I tested the mechanism and the sac had dried out. 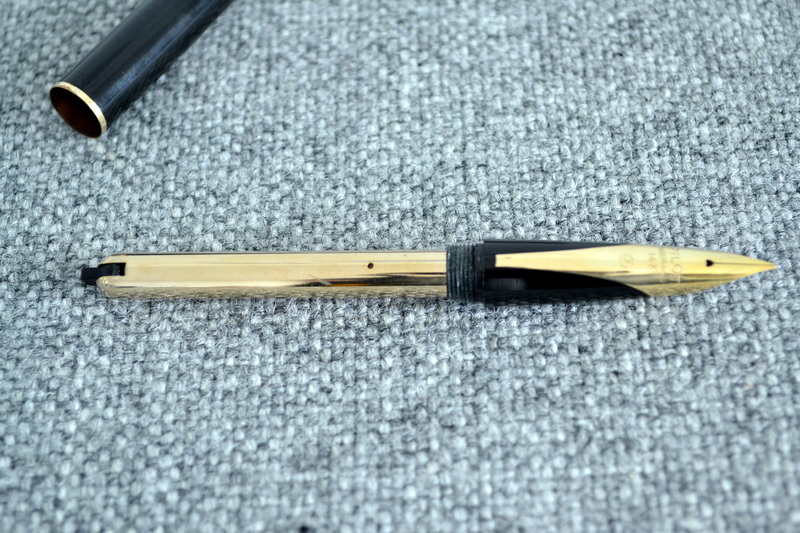 I asked a couple of well known restorers/nib meisters and to my surprise the first three said they wouldn’t work on the pen, not having worked on one before. John Mottishaw agreed to do the work and upon return the pen functioned beautifully. When the pen ran out of ink I flushed it a few times and RATS! the pressure bar detached from the switch and back to Mottishaw again it went. This time he beefed up the internals a bit and it seems to be working. This pen holds a good amount of ink but I wish the mechanism was more robust. I picked up this pen for right around $600 and that is quite a lot of money for an old black pen. I have consulted with a few collectors and I was told that I got a decent deal. The pen is beautiful but you really have to appreciate the design to justify spending the money. I want to use and enjoy this pen but if it breaks on me again I may have to let it go because what good is a pen that you can’t use? The beautiful and rare 500 is a great writer that’s only hitch seems to be it’s fragile filling system. I would like to thank Mr. Bruno Taut for his excellent articles on the Pilot Super Ultra 500. Here are links to those articles (including disassembly instructions Ultra (III)). 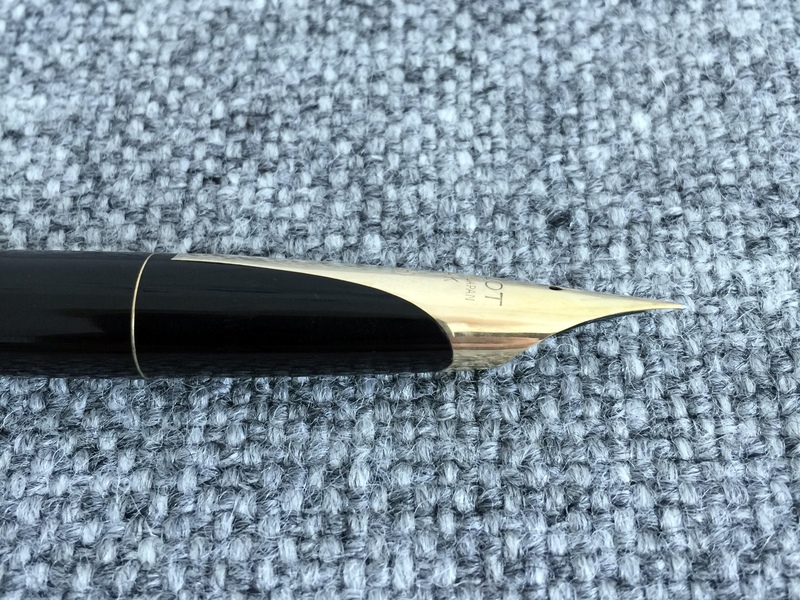 Great review of a great pen! I especially like and appreciate your thoughts on the points system. Objectivity aside (is their truly such a thing? ), it is the experiential components and a visceral response that resonate with me most. Obviously there is a place for function, reliability, etc, but what really sticks with me is how I feel when I use it, and/or don’t, ya know? Thanks again, B!